Christmas isn't just red and green any more. Look at all these fun colors. I was feeling a little clever here. I had some chipboard pages that I hadn't used in one of my Maya Road books. I used them as covers and cut pages to fit. This is another gft that I am going to give to one of my relatives. This cousin happens to have a little girl that will look great on the colorful pages. I do have to tell you...that I had a great time using the cuttlebug on these die cuts. I also inked like crazy. You can see the full book on my blog. Actually, there are two kits for December. Classic Christmas and Past & Presents. The first kit is classic green and reds with a little twist of blue. These papers have more traditional images like trees, poinsettias, etc. The colors are brighter and have a little contemporary look as well. There are many wonderfully fun things in this kit as well: A vintage Lay-Away tag, a glittered word, packages of felt hearts and rub-ons. 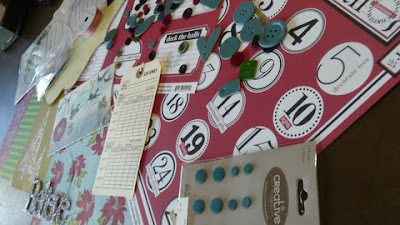 Lots of buttons and little chipboard pieces as well as large tags. The papers in this kit have been popular this year. The countdown paper and the journaling tag paper have really cute flip sides too! Below is a layout done with some of the pieces from the kit. The second kit is a little more elegant and a more vintage styling. These papers do not have traditional images and although they would make lovely holiday pages and projects, but they could work for things all year long. Can you make up your mind? OK. Maybe you'll need both! These are in the store-online and in Waxahachie if you wish to purchase them. As usual, we'll do a give-away for project pictures sent to us. More on that later though! Today we had our 1st Santa's Workshop. During the summer our pre-teen crops got so popular, Heidi decided to try a Santa's workshop during Thanksgiving break. She designed 3 projects for the girls to make that could be given as gifts, this event was 10-3pm and included lunch. This week my sister, her husband and my niece and nephew came to visit from California. My sister is the one who got me scrapbooking years ago. We have always enjoyed creating things together, because she has a very demanding job and two kids she has not done a lot of scrapbooking in a long time. So when she came to the shop she eyed this advent calendar and decided to make one. As you can see it runs in the family, she still has it! I will say she still thought eyelets were set with a hammer, she was amazed at the crop-a-dile! Her new favorite things are the stickles! I cannot believe how much our kids have grown up, it seems like yesterday Antonio and Alysia were calling Denton "Baby Denton", they are 2yrs older than him. Alysia and Madeleine enjoyed some scraptime themselves at my work table. Alysia wanted to go to work with me everyday. Hope you all enjoy Thanksgiving and being with family and friends, remember the things you are grateful for and eat a lot of PIE! Have I mentioned that I loved the Maya Road Petal book. I just can't get enough. I wanted to make a reindeer album for a gift. I think this idea works great with any two contrasting colors. I used Cosmo Cricket here....but there are many other brands that would work. You can go to my blog and see all the pages inside. Click HERE. Thanks for looking. 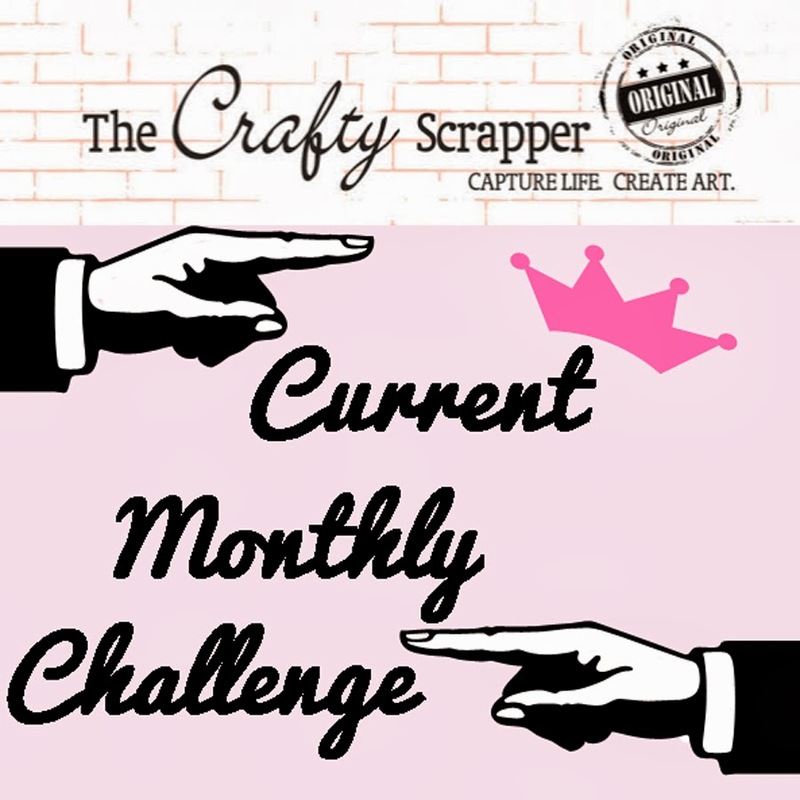 If you haven't heard, Cheryl from Ten Seconds Studio and I are having a little challenge. For some reason she thinks she can do more projects than me.......be sure and check the ones that she copied on her blog! Here's one for you Cheryl, it started out as two seperate projects, but decided to combine them. I am a fan of using anything for projects. Joanna had to buy a BUNCH of vintage Christmas balls for a class she is teaching. Many of them came in these adorable little boxes. Once the balls were out of the boxes though, the question became what to do with the little boxes. We couldn't bear to throw them away, so they were kept. Here is what Joanna has done with one of them. 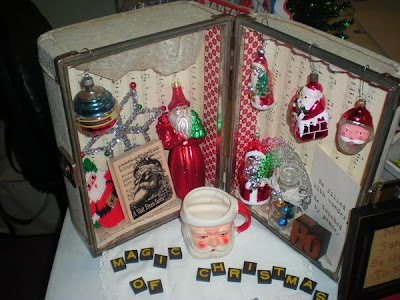 A very cute little shadow box decoration. She has also used random objects to make other groupings. Thought you would enjoy looking at these! 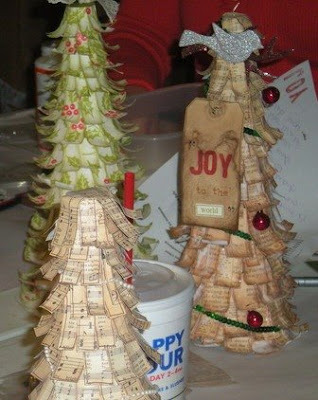 The class she is teaching is to make a lovely vintage looking paper tree with the little vintage balls. The second class is coming up in December. Check the Events page for all of the information. ...and that's what we did. I had to go out to Ten Seconds Studio today and get more goodies. While we were there we decided to go out to lunch and head to the new Michael's that everyone is talking about. What is it those girls always say "Do you have big Mamas?" Or should we say nose picker. They started laughing at me because I was filling up a shopping cart with stuff to make projects. Maybe they were laughing because I never have time for creating things, so why was I buying more stuff! And poor Cheryl keep picking up stuff and asking "how would that look with metal on it?" Megan just looked at her told her to put it back. Cheryl and I went nuts over all the blingy garland and all the possibilities, I finally had to strangle Cheryl because she wouldn't let me get any. She actually told me I could go to the Michael's in Cedar Hill if there wasn't any left, I had to take her down! I managed to leave with 5 bags of stuff, stuff to make Christmas trees, snowman Christmas cones, wreaths and plenty more. Thank you for a awesome day girls, I really needed to get away and have fun. I do not think I have laughed like that in a long time. One of the items at the front of the store as an idea is this banner made from pages from the accordion acrylic house album by Maya Road. 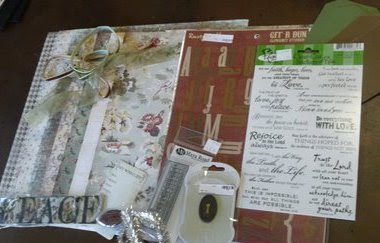 Maya Road has so many great chipboard, sheer and acrylic pieces. It is fun to pull the albums and sets apart and make them into something new. Here are instructions to make one of these for yourself! *Take the metal rings out of the book, leaving the acrylic shapes separate. *Choose 5 shapes you want to work with. *Cut out the shape in the desired paper. Cut it out so that the front of the paper is what will be against the acrylic shape. You may decide to use different papers for the house and the roof or for the chimney. *Peel the protective covering off of the back of the house pieces. *Glue the paper to the acrylic piece. You want the paper design to show through the acrylic. The paper is glued to the back of the piece. Several adhesives work for this. Diamond dust and glossy accents are two that work well. *Once the glue & paper is dry, sand the edges lightly. This will blend the paper into the piece. *Peel the protective cover off the front of the acrylic piece. *Use a white paint dabber and dab the edges of the acrylic piece. Slide it a little here and there to give it a rough, random design. You are trying to simulate a snowy look. *Once dry, take an appliqué pen. This one has the white/off white one. Place this along the roof line and chimney and any other place you want a thicker snow look. *Use a heat gun and heat the paint used from the appliqué pen. Do not get it too close to the acrylic, but close enough to make the paint puff up. In the example, we used zip dry glue to attach the houses to the ribbon, but most glues will work for this. *paint swirls with desired color (red in the example), stamp with white ink, or draw on it with white pen. *paint snowflakes with white paint. While still wet, sprinkle white glitter over them. You can repeat once dry by using a glue such as diamond glaze. Use these elements to complete the decoration of the front of the houses. In the example, the swirls were placed to where they overlapped the houses. It actually provides a little bit of stability, but not enough to just use by themselves. Put rhinestones in the center of the snowflakes and strips of them at the bottom of the houses. Add any other little words or decorations desired. Let the banner dry overnight before hanging it. This is kind of a funny story......last winter we bought these books to do a class, which we never did. In the last year we have tried to give it to different design team members, and it keeps coming back un-done. I found the box of them the other day, and my sales rep. gave me pictures of one that Karen Russell had done. So this is my take on it, and I must say it came out cute.....I do not know why all of you had a problem with this book, LOL! I used the new Basic Grey Wassail, Karen Russell scallop paper and Yellow Bicycles new Christmas Line. As you can see the book pulls out so you can see a little of each page. Ok here is your little tutorial.....Caroline from Maya Road showed us this, and it turns your chipboard into fancy letters. All you need is Chipboard, ink, stamp, Utee clear embossing powder, Versamark pad and a heat gun. Take your chalk ink and color your chipboard, then stamp swirls or script letters, you can even do a little doodling like the "H". If using pigment ink, make sure it is dry, place colored side down on the embossing pad, then place in Utee embossing powder. Make sure you have a good coating on, then use heat gun. Let it dry and repeat, you may need to do it a third time. This is hard to see, but I distressed the scallop paper and then used a script stamp on it. 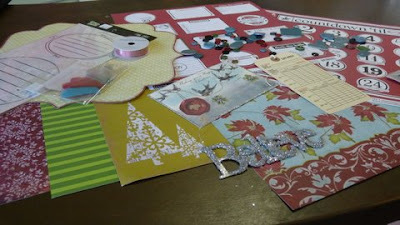 ....and he has brought lots of Christmas paper, embellishments, stamps and ideas. We have been so busy trying to get everything out and making Christmas projects for everyone. Here is a quick list of the Christmas collections you can find at the store, but hurry they were flying out the door on Saturday! CI Tinsel Town, Danielle Johnson and new line that just came in. Oh my! Now that I look at this list, I didn't realize how much I bought.....but we love our paper! I will try and post some projects this week, I am finishing up on a really cute holiday book. Betty, of the design team made some games from Maya Road Items. At the front of the store is a table full of ideas for gifts &/or home decor items that the design team has prepared for our customers. The hope is that it will give some inspiration for great gifts on a low budget. Most can be made in a small amount of time as well. This first game is travel tic-tac-toe. 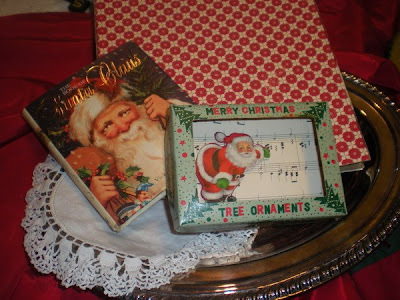 She used an empty Maya Road Tin, placed ribbon inside for the grid. She then made two shapes to play with and put them in other smaller Maya Road Tins. The game shapes are magnetized so that they don't slide around even in travel. Clever idea made from left over items. The second game is one she came up with on her own. Designed to be played by smaller children, it is a matching game. The instructions are pretty clear in the pictures. She used Maya Road Coaster book in a box along with the Maya Road Stamps for the animals. As you can see, there is an animal stamped on the coaster from the box and in the bag is the same animal stamped on the animal shaped key chain by Maya Road. Again, an easy to make game for children and great for travel or home play. The design team has been thinking about and preparing items for a month or so to provide inspiration to shoppers. 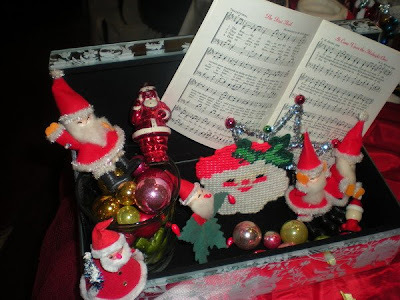 I hope you will take time and visit the table at the front for more clever and inexpensive ideas for your holidays. At the Crafty Scrapper, it is totally looking like Christmas! I was so excited today at the store that I couldn't wait to create this little Maya Road book. I used the petal book and another book. 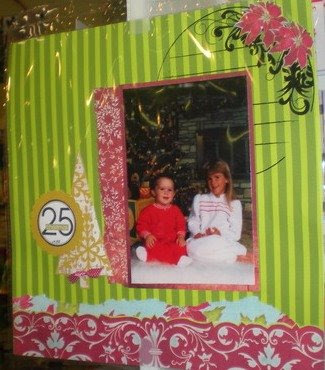 I added the yummy Christmas papers to create a fun "Christmas Together" book. I think that the petal book is perfect for use with those childhood hand prints to make a great little ornament as well. I could even see making a pendant using reindeer and snowmen. I hope this gave you a few ideas. I do not know were this week went, one minute it was Monday and now its Saturday night! We had our annual pumpkin carving Thursday night. Marie really got into carving this year, check out her cat pumpkin below. As usual the kids do not like to clean the pumpkins out.... This was Denton's first year to clean and carve a pumpkin all by himself, and he was quite happy with his little pumpkin. Then Friday we were off to trick or treat around the square. Every year all of the downtown merchants buy a lot of candy, and I mean a lot of candy, and all the kids fill the sidewalks and trick or treat. Its a blast to see all the different costumes. This year Denton wanted to be a scary vampire. Then we were off to hit the neighborhoods until the kids feet, or ours, wore out. Saturday Denton and I were up early and off to meet Cheryl from Ten Seconds Studio, at the shop. She came down to tape some upcoming Taco Tuesday episodes. If you have not watched any of these, its a must they are GREAT fun! As you can see here, Cheryl is happy to finally have the grandchild she has been wanting........You know they actually look like family! While all this was going on we had two different classes going on at the same time. Brook taught the Record Bind it all album and Annette taught the Thankful album class. I think everyone got wind that we had all the new Christmas lines in, the store was packed all day with people coming wanting to get started on Christmas projects. At the end of the day, Cheryl did a video of a tour of the store and classes. So if you have not been down and would like to see this video and the segments she did with the kids, be sure and stay tuned to their Taco Tuesdays!